Intense, saturated color, often painted on single-woven surfaces. Seemingly tribal patterns: perhaps Australian Outback, American Indian or Celtic in origin? 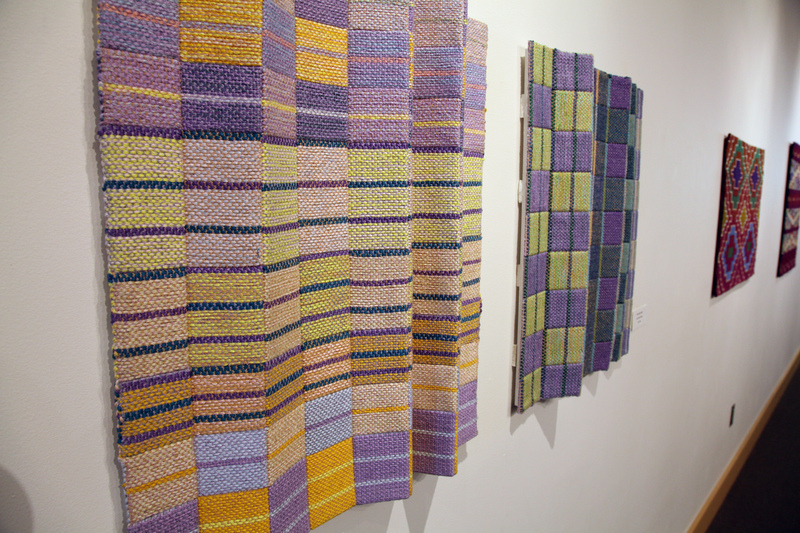 Dimensional forms created by double-weaving on a hand loom. John Hess is a master of what he does and his show at The Gallery at Library Square, The Seeing Eye: Woven Textiles, satisfyingly demonstrates this. He says his art develops “very intuitively, making changes as the weaving progresses. The amazing transformation of the many threads coming together to create wonderful shapes is magic.” And that it is. There’s nothing cramped about this expansive exhibit – the 20 woven mixed-media pieces of varying sizes in the gallery each has plenty of surrounding white space allowing for easy contemplation of individual works and lending an overall elegance to the show. Collectively the work exudes an aura of peacefulness you actually can absorb by sitting quietly on the bench that is so thoughtfully provided. You feel you are in another place altogether – no planes blowing up, no politics. Hess has created a room that is a varicolored dreamscape where one can just breathe and enjoy. Not so much with two of the works in the corridor introducing the exhibit — “Sight Unseen,” a folded painted relief that rolls and flows primarily in blues as you enter, and “The Seeing Eye,” for which the show is titled, which seems to be a series of floating eyebrows of varying sizes and three very large eyes. These pieces feel a bit cold in comparison to what is waiting inside. But, in the other corridor is a marvel in the same thread: “Revolving Evolving Eyes” is a thrilling work of planets that seem to spin on a red background: Dizzying and easy to miss. Be sure and find it. Sounds rather like a chess game he plays against himself. And his intricate work can feel like that, though the viewer is never his opponent but always a welcome onlooker. One wall of weavings at the library simply sparkles. And there’s a theme: all the pieces are “paths”: Blue Encrypted Paths, Silver Encrypted Paths, Four Red Paths – these first three could easily hang in a Victorian home – Twenty Diamond Paths (sold), Seven Luminous Paths. This last one, the only piece in the series that’s rectangular in shape, has a Buddhist emanation. Flat woven and mounted on wood, it sings in harmonious honey mustard and deep blue with glowing painted purple discs (seven, of course) replete with shiny orange, dark pink or salmon centers. Next to it, Twenty Diamond Paths, done in much thicker multicolored thread, has tiny silver cups creating the diamonds. “Folded Elliptical Variations,” a folded painted relief and the only diptych in the show, is remarkable in several ways. Its difficulty to accomplish is apparent; patterns and colors line up on the work even though one piece has a section dropping down, the other going up above the main joined pieces. And, it’s just plain fascinating to contemplate. But the piece that may keep drawing you back is “Illuminations,” hung by the entrance where the light from the windows, well, illuminates it. Strong and pleasing yellow is highlighted by rectangles of shining bright gold paint over a purple-and-white woven checkerboard grid. A black and seemingly white (until you look closely and see the multiple colors woven into it) grid in almost an argyle pattern is striped diagonally with red. The diamond shapes at the top subtly continue the seeing-eye theme of the exhibit. It’s an enthralling work and an absorbing show. Peaceful, artful, perfect. Great review of John’s beautiful work.